Highways today are full of cars, truck, and SUVs with people busily traveling where they need to go. Unfortunately, accidents often occur causing damage to personal property and injury. Automobile accidents can result in property damage, lost wages, medical bills, pain and suffering, loss of future earning capacity, and even wrongful death. 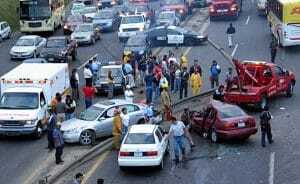 If you have suffered property damage or injury as the result of an automobile accident and the other driver was at fault, you may want to pursue a claim against the driver to recover damages. If you have been involved in a car accident where the other driver is at fault, the first thing that you want to do is to submit a claim to his or her insurance company. If the driver has adequate insurance, this is often satisfactory to recover damages for minor car accidents. However, if the driver is uninsured or under-insured you will want to contact the driver directly by certified letter requesting that the driver directly compensate you for the damages you suffered as a result of the accident. There are times when neither the other driver’s insurance company nor the driver are forthright concerning compensating you for the damages which you suffered as a result of the accident. In this instance, you may want to file a claim in small claims court to try to recoup the damage amount. It is important to note that the recovery limit in small claims court in the state of New York is $5,000. You will want to make sure you file the claim in a timely manner within your state’s statute of limitations. The statute of limitations for filing a claim concerning a car accident in most states is two years. To file a claim in small claims court for the accident, you need to go to the county clerk’s office in the county where the accident took place and file a petition. Next, you will want to compile all evidence related to the car accident claim. This evidence may include: police reports, pictures, medical bills, statements from eye witnesses, and property damage estimates. Have the defendant served. Present your evidence to persuade the trier of fact that the defendant is at fault. And a verdict will be entered either by mail or at the end of the hearing. The process of suing someone for a car accident is pretty much the same for filing a claim in district court. However, this process may not be as easy as it sounds. The burden of proof is on the plaintiff to prove by a preponderance of the evidence that the defendant was at fault and that the defendant caused the plaintiff to incur a certain amount of damages. Therefore, if you are seeking a significant damage amount, if would be wise to retain the services of an experienced automobile accident and personal injury attorney to make sure your case is filed properly, prove your case, and get you the settlement or jury award you deserve. So if you need help learning how to sue someone for a car accident contact Pulvers, Pulvers & Thompson today for your free New York personal injury consultation.